Tomorrow morning I will once again be a guest political analyst on the Fox 25 morning news segment Tolman and Gray. Boston City Councilor Michael Ross, Fox 25 political commentator VB and I will be discussing Hurricane Irene and continuing recovery efforts, the arrest of Onyango Obama, President Obama’s half uncle, and the possibility of more candidates joining the U.S. Senate race here in Massachusetts. Please tune in at approximately 7:15AM to watch tomorrow’s segment. Tomorrow morning I will be talking with Jeff Katz of the Jeff Katz Show on Talk 1200AM Boston to discuss the federal “secure communities” program. Please tune in or click here tomorrow morning at approximately 7:35AM to listen to our lively discussion. I was in Fox 25's Beacon Hill studio yesterday morning serving as a guest political analyst on the station's "Tolman & Gray" segment. I joined former state Senator Warren Tolman and Fox 25 Morning News co-host Kim Carrigan to talk about how the 2012 Presidential race is heating up among the many Republican candidates for the Oval Office. We also discussed President Obama's plans to vacation on Martha's Vineyard, which has drawn some criticism due to the nation's unresolved debt problem and high unemployment rate. Check out the spirited debate by playing the video link posted below. I was a guest on the Emily Rooney show on WGBH radio Wednesday afternoon, where we discussed the habitual traffic offender bill House Minority Leader Brad Jones and I have filed. We currently have more than 40 co-sponsors on the bill (which was recently endorsed by the Gloucester Daily Times), and hope to add more before the end of the day. If you missed the interview, WGBH now has the audio link posted on its website. Tomorrow morning at approximately 7:15 a.m., I will once again be appearing on Fox 25 Morning News' popular weekly "Tolman and Gray" segment. Former state Senator Warren Tolman and I will be discussing the latest political topics, including the Presidential race and parole reform. At 8:05 a.m., I will be calling in to the Brad & Bo Show on WHYN radio in Springfield to discuss the habitual traffic offenders bill with co-host Brad Shepard, which is drawing strong bi-partisan support on Beacon Hill. To hear the interview live, tune your radio to 560 AM or listen online on the WHYN website. I will be dropping by the WGBH radio studios tomorrow afternoon, where I will be joining host Emily Rooney for a discussion of the habitual traffic offender bill. The show airs live from noon-1 p.m. You can listen in on your radio by tuning in to 89.7 FM, or on your computer by visiting the WGBH website. In light of the recent hit and run tragedy in Taunton -- which resulted in the death of a 17-year-old skateboarder at the hands of a driver whose license had been revoked or suspended 16 times since 1989 -- I have joined with my Senate and House colleagues to file legislation targeting habitual traffic offenders. You can learn more about our current motor vehicle laws and what my bill would do to strengthen these laws by clicking on the "read more" section below and reading the press release I issued today. With the recent arrest of habitual traffic offender and road menace Paul Baran, Senate Minority Leader Bruce Tarr (R-Gloucester), House Minority Leader Brad Jones (R-North Reading) and members of both the Senate and House GOP caucuses are taking legislative action to keep habitual offenders off the road. They have filed legislation that would provide the registrar of motor vehicles with the tools to adequately punish convicted habitual traffic offenders with longer suspensions that could result in a lifetime license revocation for the worst violators. “Drivers who repeatedly violate the law after having their license revoked are not only abusing the system, they present in many cases a serious threat to public safety. The registrar and other officials need the tools to keep such drivers off the road for more than four years at a time, and this legislation will provide them,” said Senator Tarr. Current law defines a habitual traffic offender as someone who has been convicted of three enumerated offenses (including driving while intoxicated, reckless driving, making a false statement in an application for a learner’s permit or driver’s license, leaving the scene of an accident, operating a motor vehicle with a suspended license, driving without a license and the use of a vehicle while committing a felony) and/or has committed 12 other general traffic offenses carrying a license suspension of 30 days or more. The caucus bill would create a tiered system of suspensions for habitual traffic offenders by adding to the existing habitual offender law two new categories, level 2 and level 3, with progressively increasing periods of license revocation. •	provide the registrar of motor vehicles the authority to attach terms and conditions as the registrar deems necessary if and when returning a license to any level habitual traffic offender. The bill’s sponsors are also offering the opportunity for their Democratic colleagues to co-sponsor the legislation. “Protecting public safety transcends party lines, and we need a collaborative effort to strengthen this law as soon as possible,” said Tarr. The Commonwealth of Massachusetts allows citizens to originate an initiative petition for a law on statewide ballots each election cycle. The initiative petition process is established by Amendment Article 48 of the Massachusetts Constitution as a way for citizens of the Commonwealth to propose laws and constitutional amendments for approval by the voting public. An initiative petition for a law may also be used to propose a law seeking to repeal or amend a particular section of an existing law. This year 31 petitions have been filed for proposed laws or constitutional amendments with Attorney General Martha Coakley’s Office. Of the 31 petitions, 21 were proposed laws for the 2012 ballot and one constitutional amendment was filed for the 2014 ballot. Some initiative petition sponsors submitted more than one version of a petition on the same topic. To learn more about the basic steps for filing a ballot question, or to learn more about each individual question, please click "read more" below. 8. if they gather enough, the measure and any legislative substitute are submitted to the people at the next biennial state election (in this case, November of 2012). Additional information on the petitions or petition process can be located at on the Attorney General Website. You may access this location by clicking here. 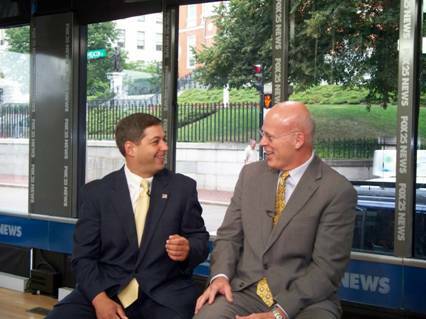 Yesterday I had the opportunity to be a guest political analyst on Fox 25’s morning news segment “Tolman and Gray”. Former state senator Warren Tolman and I discussed the instability of the stock market and the possible effects it might have on the U.S. economy. We also discussed the need to strengthen the habitual traffic offender law. Later in the day I also made a guest appearance on NECN’s “Broadside” where I was interviewed by special guest host Chet Curtis. Chet and I focused our discussion on the need to remove habitual traffic offenders from our streets, the current Massachusetts’ habitual traffic offender law and the necessity to strengthen it now. Please play the posted videos below to watch yesterday’s appearances. Also posted below is a report by Chris Cassidy of the Boston Herald which details a bill that I’m proposing that would provide the registrar of motor vehicles with the necessary tools to lengthen the suspensions and provide possible lifetime bans of habitual traffic offenders. Tonight I will be making a guest appearance on NECN’s nightly newscast “Broadside” with special guest host Chet Curtis. Chet and I will be discussing the need for substantial legislative changes to the habitual traffic offender laws. Please tune in at 6:00pm to watch tonight’s program. “Broadside” re-airs at 8:00pm and again at 3:30am. 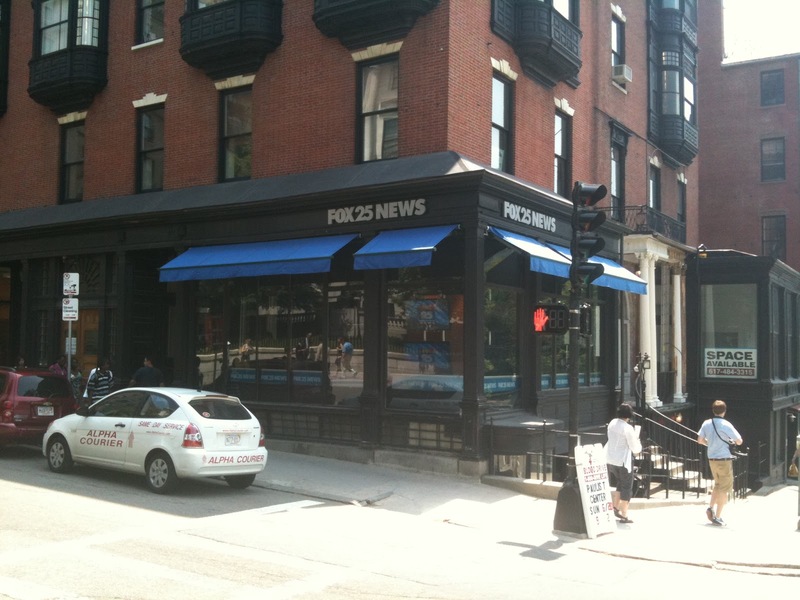 Tomorrow morning I will once again be a special guest political analyst on the Fox 25 morning news segment “Tolman and Gray”, aka “Tarr and Company”, with former state senator Warren Tolman. We will be discussing the recent volatility of the stock market and what some of the economic ramifications might be. We will also discuss habitual traffic offender Paul Baran and the need for legislative action to keep our roadways safe. Please tune in tomorrow morning at approximately 7:15AM to watch our lively discussion. This morning I made a guest appearance on Fox 25’s morning news segment “Tolman and Gray” aka “Tarr and Company”. Political analyst Warren Tolman, Fox 25 news commentator VB, and I discussed the recent passage of the national debt compromise by Congressional leaders and President Obama. Please play the posted video below to view today’s segment. I also had the opportunity to be interviewed by Jeff Katz of The Jeff Katz Show. Jeff and I discussed the possibility of an upcoming debate that could expand gaming in Massachusetts. Part of our conversation included a recently passed Senate Order filed by the members of the Senate GOP caucus prohibiting the Senate from considering or taking up a bill that would authorize any gaming not currently permitted in the Commonwealth for at least 10 calendar days. To listen to today’s interview please click here. Tomorrow morning I will once again be a guest on Fox 25’s morning news segment “Tolman and Gray” where I’ll be discussing the national debt compromise that was recently approved by Congress and President Obama. I am joined by frequent guest, political analyst and former State Senator Warren Tolman. Please tune in at approximately 7:15AM for what is sure to be a colorful discussion. Then at 8:05AM I will be discussing with Jeff Katz of the Jeff Katz Show on Rush Talk 1200AM Boston the looming debate that could authorize expanded gaming in Massachusetts and the need for transparency in that debate. You can also listen online by going to 1200AM Boston’s website or by clicking here. On Sunday, July 31st I had the pleasure of presenting a Senate Citation to Helen Donovan of Gloucester honoring her on her 100th birthday. During the presentation, Helen was surrounded by friends and family who spoke fondly of memories and past events. Helen has led a vibrant and remarkable life and still remains an active member of the community. Below is a photo taken during Sunday’s celebration. 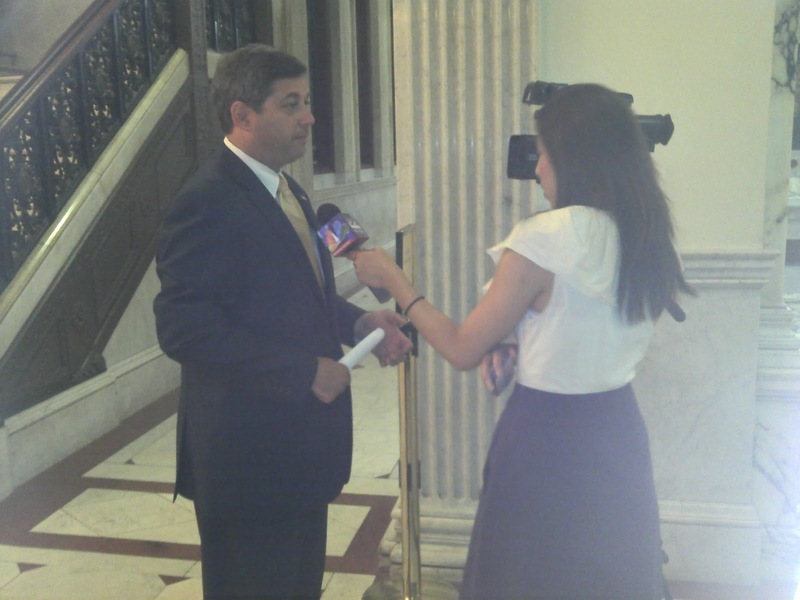 Today I had the opportunity to be interviewed by Christine Lee of WWLP-TV News 22 regarding the debate in Congress to raise the national debt limit and what it could mean in Massachusetts if a compromise isn’t reached. Please tune in to tonight’s broadcast at 5:00pm, 6:00pm and again at 11:00pm.